Cranberry Shores Chorus - Book Us! 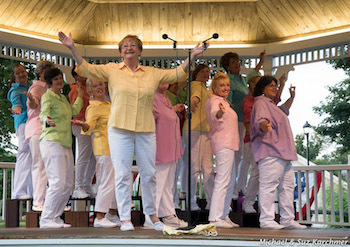 Hire Cranberry Shores Chorus as a full show chorus or ask for a small group. You can also hire one of our fine a cappella quartets. Contact us to customize a performance to fit your needs. Performance packages consist of a variety of music including jazz, rock, patriotic, ballads, and holiday. Performance times can be adjusted to fit your specific program needs. Quartets from within the chorus may perform as part of the "show package." The fees for our performances vary and should be discussed with the chorus performance manager. Holiday parties and Strolls Festive a cappella renditions of your holiday favorites add to the merriment of your seasonal get-togethers. Civic Organizations and Clubs Planning some entertainment for your meeting? Schedule our chorus to illustrate the power of harmony! Sporting events Cranberry Shores Chorus would be happy to sing the National Anthem before the fans at your upcoming game.